FMX Icon Brian Deegan Takes Home Two More Podium Finishes! CORONA, CA (July 27th) – Race fans make their way to Lake Elsinore, Ca for another sell out event at Rounds 7 & 8 of the Lucas Oil Off Road Racing Series. Freestyle Motocross Icon Brian Deegan was a crowd favorite this weekend after winning Round 5 of the Series in his hometown ahead of undefeated short course champion Robert Naughton. Deegan built a short course track near his property to get some extra seat time to work out all the kinks on his Ford Unlimited Lite truck. 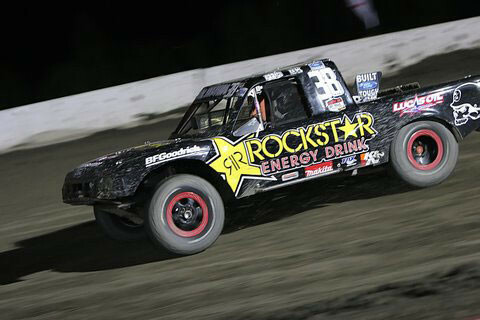 Focused on locking down a podium finish once again, Deegan qualified 4th on Friday for the Rockstar/Metal Mulisha/Lucas Oil race team, his teammate Todd Cuffaro qualified an impressive 1st. At the start of Saturday’s main event, Deegan pinned it to the front of the pack and found himself leading the entire race. On the last turn of the last lap a minor error by Deegan cost him a 2nd place finish; still an impressive podium position for someone who in his first year with his newly formed Rockstar/Metal Mulisha/Lucas Oil race team is sitting in the top 3 in point standings. Deegan’s teammate Todd Cuffaro was running in 3rd place after the mandatory caution, but on turn 2 the dirt got the best of him and Cuffaro ended up flipping out finishing 11th in the Unlimited Lites Class. 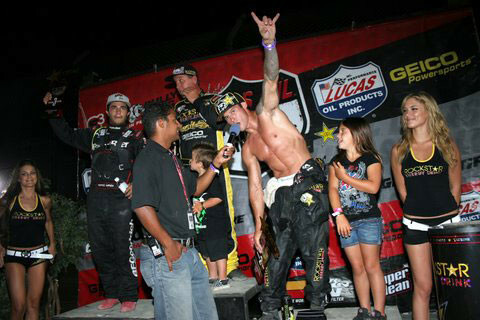 Sunday’s race proved to be another exciting race for the fans and crew of the Rockstar/Metal Mulisha/Lucas Oil race team. Deegan was out front battling for 2nd position with Robert Naughton when the pressure from Deegan proved to be too much for Naughton’s truck to handle. Deegan blew past Naughton giving Brian another 2nd place finish for the weekend! Teammate and 2008 Pro-Lite Rookie of the Year Todd Cuffaro battled his way from the back of the pack to finish Round 8 with a 4th place position. Rockstar Energy Drink, Metal Mulisha, Lucas Oil, Cuffaro Motorsports, Ford Trucks, Nogrady Motors, Parker Pumper, K&N Air Filters, KC Hilites, ZLT Stickers, AlpineStars, Richardson RV, Jayco, BFGoodrich Tires, RBP Wheels, Hevy Hitters Toys, Etnies, Von Zipper, Kicker Audio, Smith Designs, Yucaipa Auto Body. Keep posted on BrianDeegan.com for more updates!